When my husband Nikhil told me that, we are going to Panhala for the weekend, I was happy, but, when I heard that we are going on a two wheeler, I was a little disappointed. Why you need to strain yourself on a bike, when you can go enjoying music in an Air conditioned Car? After a short argument, I agreed ( as if I had a choice!) and started to pack for destination Panhala. We left home next day in the morning with our backpacks on. 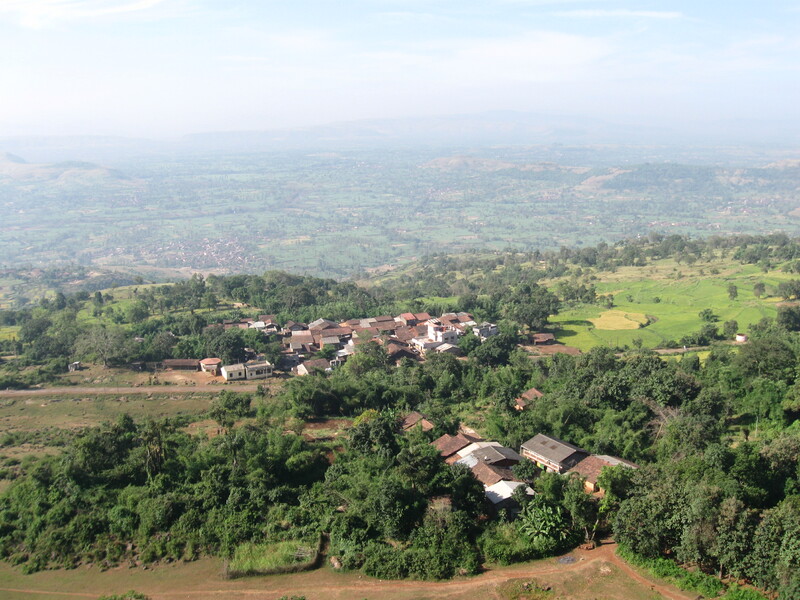 Panhala is about 20 kms from Kolhapur, and about 3,000 Feet above sea level, a mountainous road. The beauty of the road is that it is surrounded by huge trees and farm fields on both the sides. Within half an hour we were riding uphill the Fort city and we could feel the chill in the air. The city welcomed us with the statues of two brave soldiers of Shivaji Era. We had breakfast at a small hotel, and headed towards the places to see. Our first stop was Andhaar Bawada (Well). Localites said that it is so called because one cannot recognise the well from outside the Fort as it is hidden under a two storied building. From the building we can see the greenery. Soldiers and local people at that time used the water for drinking. What a way to trick your enemy!! Just near the Andhaar Bawda, there is another place called Teen Darwaza. 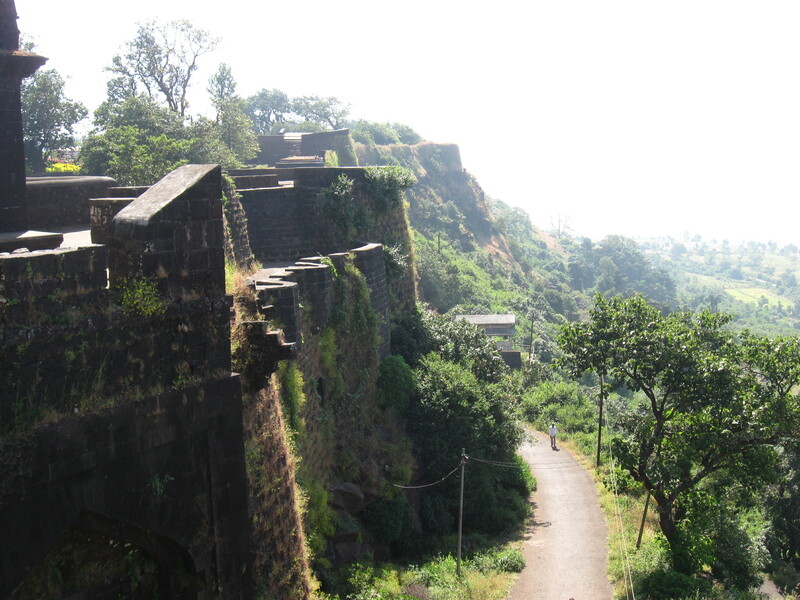 Though the Panhala Fort has been built in between 12th and 13th centuries by Raja Bhoj II, it gained its name and fame when the first ever crowned Maratha King Chatrapati Shivaji conquered it in 16th century. 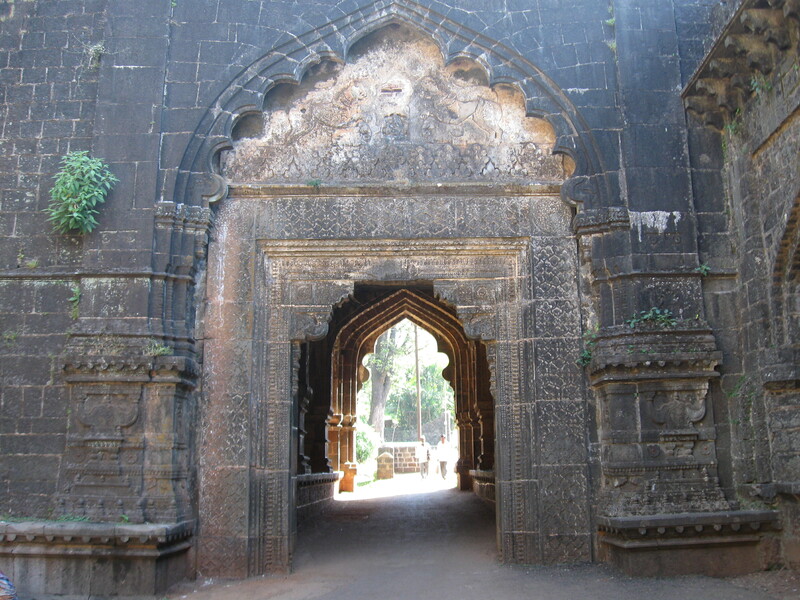 Teen Darwaza was the main and only entrance inside the Fort at that time. The three gates are one within the other so from outside, one can see only the first gate. The fort is built in stone by using the mixture of jaggery, lime and mud in the absence of concrete (what durability as the Fort withstood many invasions thereafter and is still standing!!). As we were inside the Fort, we entered from the Third main Gate. There we can see the carvings of Lions and elephants on the Huge Entrance. Once we are out to the First Gate we can really see the beauty of the architecture on one side and mother nature on the other. The weather was perfect with sunshine and cold air, hence, we decided to see the next place by walk. Our next stop was the Watch Tower. May be this is the highest point of the city as the view from here is awesome. We could see the valleys spread with greenery and the hills stretched a long way. We took our time there sitting on the age old stone benches and savoured the nature. It was lunch time and we went to a hotel near the Panhala Bus Stand where we had a Kolhapuri mutton meal with the ubiquitous Pandhra and Tambda rassa. The food was mouth-watering and had a typical Gavaran touch to it! After having the delicious food, we went to see a place called Ambarkhana i.e. Godown. Built by Raja Bhoj II, Ambarkhana includes three buildings named Ganga, Jamuna and Saraswati. Ganga being a huge building where foodgrains were stored in those days. History tells that at the time of Siddhi Johar’s attack, it enabled Shivaji to sustain a 5 months siege. It was time for us to see the Tabak Udyan. We guess it is an old garden but, well maintained by local authorities. We had a stroll in the garden. We then did some trekking in the adjoining mountain, although I am reluctant as far as trekking is concerned. We were tired after the trekking. Then we decided to check in to our hotel and retired for the day. The hotel we stayed has almost all its rooms facing the valleys. The view from the room was beautiful. When we woke up next morning, we were greeted by the beautiful valley. We had our tea and breakfast in the garden restaurant of the hotel, facing the valleys. We went to see Sajja Koti or Sardar-e-Mahal, a two storied building surrounded by green. It is said to be the pleasure pavillion of the Kings which provided a panaromic view of the valleys. Now, on its roof, you can see the surrounding views of Panhala through a telescope (paid, of course). We could see The Jyotiba Temple, Masai Pathar, and even vacation homes of Bollywood Filmmakers like V.Shantaram and singers like Lata Mangeshkar. We then went to Masai Pathar, which is a table mountain (no, not the one in Capetown). 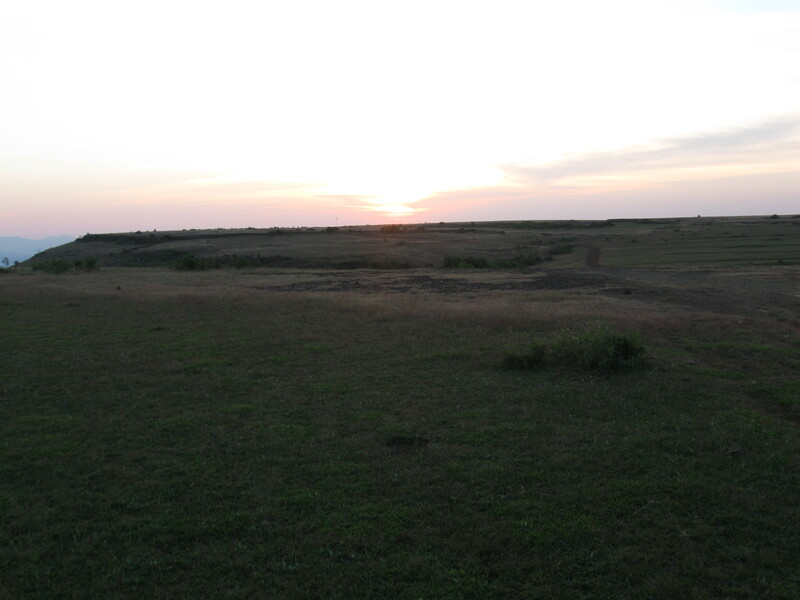 The hill top is flat and is a good place to enjoy with our family and play games and hang out. That was the end of our adventure journey to Fort Panhala. Despite my initial disappoint of travelling on a two wheeler I enjoyed the weekend to the fullest and felt it refreshing. And I will try to listen to my hubby as he comes out with some wild ideas, which just seem to work (pun intended). Next postBeware of Fuel Adulteration!! Hi, very nice review. 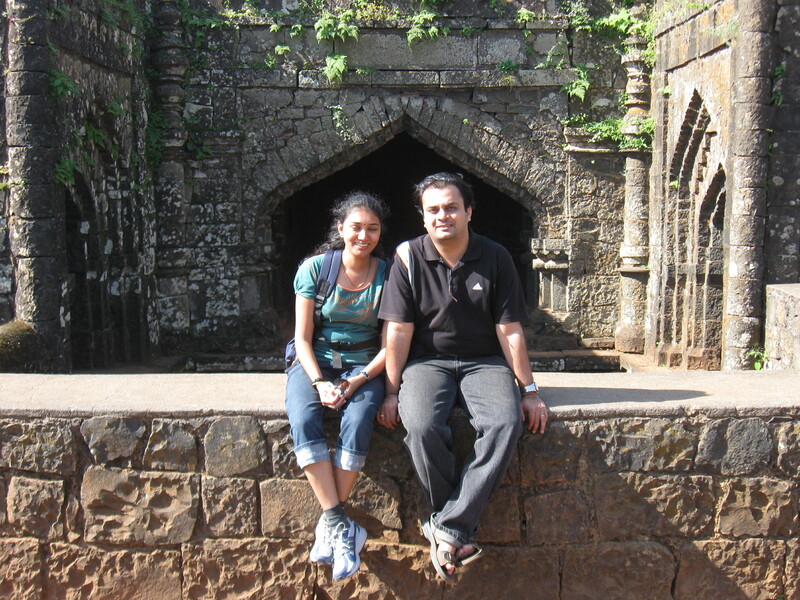 I am from Pune and planning to take my parents to Panhala in June. This will be our first time. Could you please let me know the name of the hotel you stayed in? It would be of great help to me. Hi! Thanks for your comment. The name of the hotel we stayed is Valley View Grand. Have a nice trip! Hi, Very intresting review. I am from Pune and planning to go to Panhala in May. This will be my first time. How is the weather there in May? Any idea about the Hotel Hill Top over there? Hey Thanks Sagar! Weather is quite ok in May though hot. Best time to visit is during and after monsoon. I have never been to Hill Top Hotel but heard it is quiet and peaceful. In fact all meditation courses take place in this hotel. You can also visit nearby places like Jotiba, Pawankhind among others! Have a nice trip. Sorry for the very late reply. The ghat roads are absolutely safe. But don’t forget to wear helmets. Always recommended to keep engine on while driving even downhill.